(CNS): A sixteen year old boy who has been charged with robbery in connection with the hold-up at a grocery store in North Side has pleaded guilty and was remanded in custody by the court Friday to Eagle House, the young offenders unit within HMP Northward. The teen, who cannot be named for legal reasons, is accused of being one of four men involved in the robbery at Chisholms supermarket on Monday 23rd September. Two armed men were said to have entered the store and stolen cigarettes and cash from the till as well as jewellery from two women in the store. They fled from the scene in a grey hatchback which was pursued the police helicopter and a patrol car. 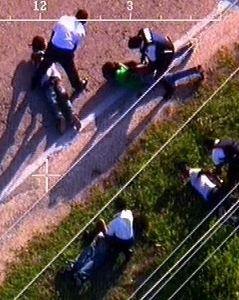 The escaping suspects had triggered a major chase which saw the helicopter direct an RCIPS patrol unit on the road who was able to tail the robbers at a safe distance as the helicopter get a lock on the getaway car. The car eventually stopped in High Rock where the ground unit of unarmed officers arrested the four men in the car but they did not recover any firearms at the time of the arrest. The teen was charged along with three other men aged 19, 20 and 29 years but the youngest ten is the first to enter pleas in relation to the hold-up. (CNS): A sixth man accused of being part of the gang which robbed WestStar TV’s offices last year has formally denied the charges and will now stand trial in June next year. Beaubijohn Clarke, who is accused of robbery and possession of an imitation firearm, pleaded not guilty when he appeared in Grand Court Friday morning before Justice Charles Quin. The charges come following the recent conviction of three other men for their part in that robbery and a heist at Cayman National bank a few weeks later. David Tomasa and Andre Burton were sentenced on Tuesday to 14 years and Ryan Edwards was sentenced to 13 years. George Mignot, who was also suspected of being one of the robbers at the television centre’s office in George Town, was acquitted. However, he was handed a 12 year sentence on Tuesday for his part in the Cayman National robbery, along with Tomasa, Burton and Edwards. Meanwhile, Matt Dillon, a key prosecution witness in both cases who has denied robbery but admitted being involved in the West Star case, is also expected to be sentenced this month for his part in the bank heist and the TV office hold up. (CNS): The United Kingdom’s overseas territories minister is making his first trip to the Cayman Islands on Tuesday but he will be here for just one day before he visits Jamaica. 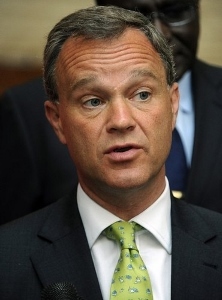 Mark Simmonds, the Foreign and Commonwealth Office junior minister, will have a packed agenda on his short visit, which comes just three weeks before the annual Joint Ministerial Council in London, where the relationship between the UK and all of its territories comes under the spotlight. According to the governor’s office, this visit will focus on enhancing the relationship between the UK and the Cayman Islands and their shared agendas before the summit. “I am delighted to be making my first visit, as a minister, to the Cayman Island, an important centre for the global financial services industry," Simmonds said. “I am looking forward to meeting Premier McLaughlin again and his colleagues in Government and to discussing with them how we can work together on our shared commitments in the White Paper and the JMC communiqué. I am particularly looking forward to meeting young Caymanians and hearing about the challenges that Cayman’s youth faces now and in the future,” he added. Simmonds will have meetingswith the premier, the finance minister and he will call in on the Cabinet meeting. Other engagements will include meeting with opposition MLAs, a visit to the port area, and the lion fish lab at the Department of the Environment. He will also receive a presentation on the Health City development. The premier will host a reception and Simmonds will address a dinner hosted by the Chamber of Commerce in the evening. (CNS): The government has released its strategic outline case for the redevelopment of all three of the Cayman Islands' airports. Officials said that Cabinet has approved the first step in the process, which is the policy directive outlining the reasons for the projects, which will be the precursor to any business plan and the procurement process. The deputy premier and minister with responsibility for tourism, Moses Kirkconnell, said the policy addresses the sustainability of air transport for the Cayman Islands and the development of tourism opportunities. 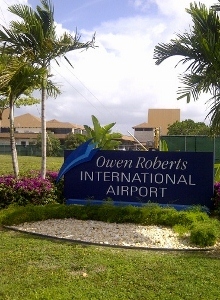 Government has outlined plans to redevelop Owen Roberts International Airport on Grand Cayman, enhance the Charles Kirkconnell Airport on Cayman Brac and develop an entirely new airport on Little Cayman in the north east of the island. The policy objective for the airports has been published following Cabinet's approval of the tourism ministry’s plans for the cruise berthing facilities in George Town and the move towards a tendering process for that project. Although the cruise piers have been identified as a priority for the government, the Progressive administration has also pointed to the need to work on the airports. While overnight visitors make up just 20% of the tourists that come to Cayman, they represent some 77% of annual tourism revenue. As well as boosting visitor numbers, Kirkconnell said a number of other benefits would come from the airport projects. “The construction and development phases, followed by fully operational facilities will generate additional jobs. More importantly, it will deliver significant economic benefits to the islands, notably improving public revenue and raising the Gross Domestic Product (GDP) from increased visitor arrivals,” Kirkconnell stated in a release on Thursday, announcing that Cabinet was backing the first step in the plans. The minister said additional benefits included increased opportunity for the continued sustainability and profitability for the Cayman Islands Airports Authority. Stran Bodden, the chief officer in the ministry, said the procurement process wouldl be open, transparent and competitive in keeping with international best practice and the Public Management and Finance Law. The exact scope and size of each project will be developed in the business case, he said, and a competitive procurement process will identify who will be responsible for designing, and building the facilities. "Operational responsibility for all airports facilities will remain with the Airports Authority for strategic reasons," he added. Since government is not allowed to increase its level of debt, funding for the projects will be determined in the business case. Options identified to date include a phased programme of enhancement and expansion of existing facilities. Whatever government decides, the development of the airports will have potential environmental impacts, particularly on Little Cayman, where the pace and way of life there could be change forever by the development of an airport. The proposed site for a new airport on Little Cayman is also located by a Nature Reserve, which is home to a large colony of red-footed booby birds. The reserve is protected under the National Trust Law and the area has been designated an animal sanctuary and a wetland of international importance under the United Nations RAMSAR Convention. Given the importance of the site and other environmental impacts, government has said the department of environment will be heavily involved in the consolation process regarding the development of all three airports. See the outline policy document below. (CNS): After two days of mostly closed door hearings this week, visiting UK judge, Lord Justice Sir Alan Moses is expected to deliver his decision, Friday afternoon, in the first ever courtroom challenge to an order made by the information commissioner. The first public authority to defy an order to release a document by Jennifer Dilbert, who retires in December, was the governor’s office when it sought a judicial review after she ruled that it should release a controversial report relating to the bungled internal police probe, Operation Tempura. Lawyers for the governor’s office have argued on a number of grounds including defamatory content that the document should not be made public. 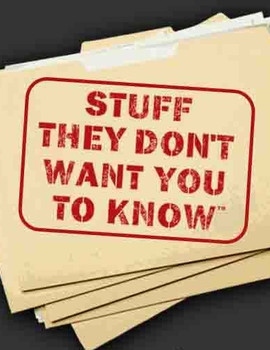 The irony of the closed door hearing in the first judicial review of a decision by the information commissioner has not been lost on most and the visiting judge is also going to deliver his ruling tomorrow behind closed doors but it is hoped that the ruling will still be made public regardless of the outcome.